Just cut to the double headlines: On Your Feet, the musical biography of Miami’s Gloria and Emilio Estefan, appropriately will begin its national tour with an unusual 10-day run in Miami in October; and the mega-hit Hamilton will appear in the 2018-19 season at the Broward Center. Schedules have been announced in the last few days for tours appearing at the Arsht Center and Broward Center under the Broadway Across America banner, and the independently programmed slate for the Kravis Center. The rosters are a combination of previous hits that have sold out locally plus a schedule of the most high-profile titles of the past three seasons on Broadway. The newer titles encompass the reinvented revival of The Color Purple, the droll Tony-winning spoof A Gentleman’s Guide to Love and Murder, the nose-thumbing electric School of Rock, the popular musical Waitress and the epic revival of The King and I. There also will be shows that never made it to Broadway (for whatever reason): Love Never Dies, Andrew Lloyd Webber’s sequel to Phantom of the Opera, and The Bodyguard, a musical theater version of the film, which opened in London and has just opened in Chicago. 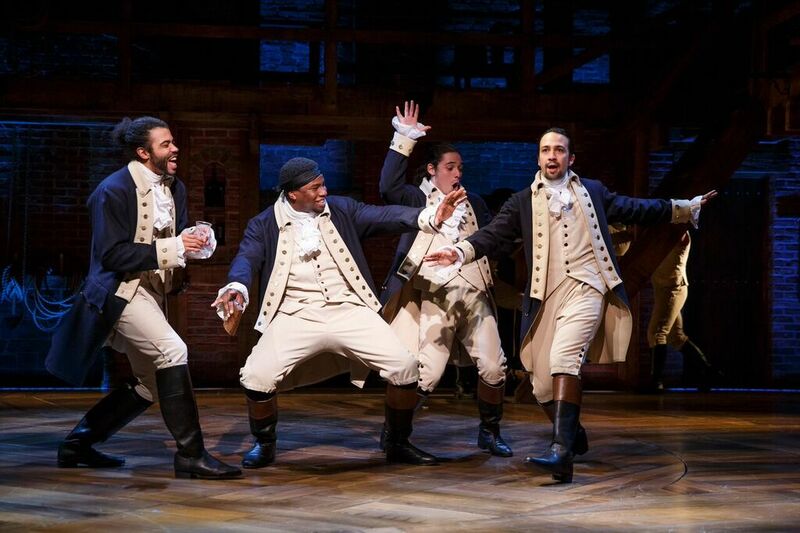 As far as Hamilton, which needs no other description, Broadway Across America has not released any other shred of information except that the best way to ensure getting a ticket is to buy a season subscription for the coming season and then renew it for 2018/19. The inference is that Hamilton will be part of that season’s lineup and that single tickets will be few and far between. A date has been chosen but it has not been revealed. In many cases, the Kravis lineup duplicates titles playing elsewhere in the region in 2017-18, but its headline is that The Lion King will play there for the first time, also in the 2018-19 season. 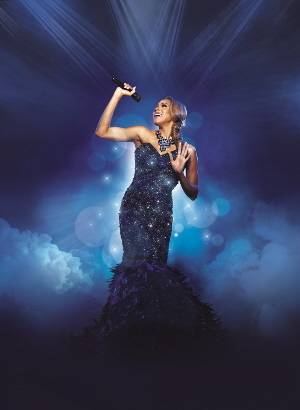 The announcement about On Your Feet was made Monday night at the Arsht Center before a large house of media reps and VIP patrons with performances from several of the coming shows and a satellite appearance by pop singer Deborah Cox who will headline The Bodyguard. But the climax occurred when Gloria and Emilio Estefan appeared on stage to talk about the choice of Miami for the kickoff of the tour. “We never changed our name. We never changed our look. We never changed our music. We are Miami,” Emilio said. During the announcement, Christie Prades, a swing player in the Broadway ensemble led other cast members in a high-energy medley of the Estefans’ hits. 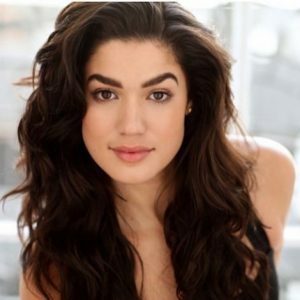 Prades is a Cuban-American singer, dancer, actress and writer born and raised in Miami, who appeared as Vanessa in Actors Playhouse’s In The Heights in 2013 and in its West Side Story last winter. Then Gloria asked Prades on stage whether she would be willing to perform Gloria in the national tour. You can guess her answer. The production is slated for Oct. 5–15, a sign of confidence because Broadway Across America rarely runs any show more than one week at the Arsht. On Your Feet opened in New York in November 2015 and has logged more than 520 performances. Bookwriter Alexander Dinelaris tracked the artistic, popular and romantic arc of the two musicians who created a Miami-Cuban sound that topped pop charts across the country. While the score is drawn from the Estefan-Miami Sound Machine greatest hits catalog, it is heavily reworked for the Broadway stage and melded into a narrative. After a Chicago tryout, the show opened on Broadway with the talents of other artists with Miami roots, notably the young star Ana Villafane who attended the same Miami high school as Gloria Estefan; Dinelaris who lived in Miami for two years while attending Barry University; Florida International University grad Andy Senor Jr. who served as associate director; ensemble actors including Natalie Caruncho and Henry Gainza, and members of the Miami Sound Machine. The show earned a Tony nomination for choreographer Sergio Trujillo, numerous nominations from the Outer Critics Circle, and Villafane won recognition for outstanding debut by Theatre World. The show has been reasonably popular on Broadway and has not posted a closing date. The show broke the $1 million box office gross in October, although ticket sales have vacillated in recent weeks between 57 and 72 percent of available seats. Finding Neverland (Dec. 26–31) This musical developed from 2012-2015 from London to Broadway is based on the popular film. It tracks the roots of the creation Peter Pan as playwright J.M. Barrie struggles to find inspiration until he meets four young brothers and their beautiful widowed mother. Spellbound by the boys’ enchanting make-believe adventures depicted in this stage musical, Barrie sets out to write a play that will astound London theatergoers. “With a little bit of pixie dust and a lot of faith, Barrie takes this monumental leap, leaving his old world behind for Neverland, where nothing is impossible and the wonder of childhood lasts forever,” the press materials enthuse. The Color Purple (Feb. 27 – March 4, 2018) This riff on the recent revival features the stripped down reimagining by director John Doyle (Sweeney Todd) from the epic original production. Its focus on the characters won rave reviews from critics and patrons. Chicago (May 8 – 13, 2018) Once more with feeling…..
Broadway Across America is offering an additional show for a separate additional charge. The Book Of Mormon (Nov. 28 – Dec. 3) If you missed this during its earlier sold-out runs in Broward and Palm Beach or you just want to see it again, here’s another chance to catch one of the funniest musicals in recent years, which is both scatologically irreverent yet indirectly admiring of faith and spirituality. A bit of a warning, it remains terribly funny on its repeated viewings, but the surprise factor is gone. To read our review of the national tour, click here. Season tickets for the five-show subscription package range from $155 to $692. Current subscribers may renew before the general public by visiting the Adrienne Arsht Center box office, calling the Season Ticket Holder Hotline toll-free at (800) 939-8587 or the box office at (305) 949-6722. Renewals are also available at www.arshtcenter.org. The renewal period ends March 26. To become a new season ticket holder, visit www.arshtcenter.org, or call the Arsht Center box office. Single tickets to the 2017-2018 Broadway in Miami season will be available in early fall. The Sound Of Music (October 10–22) A brand-new production that has not been seen on Broadway is a reimagined version from veteran director Jack O’Brien whose works ranges from Macbeth to Hairspray. Love Never Dies (Nov. 7–19) Andrew Lloyd Webber wrote this sequel to Phantom of the Opera that bowed in London in 2010, played around the world in various overhauled editions. It has never been seen on Broadway although there were plans several years ago. Some people have been ecstatic about it, others lukewarm. The script is based in part on a novel by Frederick Forsyth (Day of the Jackal) and reworked by playwright Ben Elton (Popcorn) and Webber. The year is 1907, ten years after the Phantom’s disappearance. Erik, the now dissolute Raoul and Christine Daae reappear by chance at Coney Island where a freak show and an opera house stand close by. Erik hasn’t heeded advice to get over it. School of Rock (Dec. 12–24) This stage musical riff on the hilarious film is an energizing hoot if the company hires a first-class leading actor for the ultimate slacker as wells as a preternaturally talented group of young musician-actors. It follows the wannabe rock star posing as a substitute teacher who turns a class of straight-A students into a guitar-shredding, bass-slapping, mind-blowing rock band. This show has 14 new songs by Andrew Lloyd Webber and all the original songs from the movie. To read our review of the New York edition, click here. A Gentleman’s Guide To Love & Murder (Jan. 9–21, 2018) The winner of the 2014 Tony Award for best musical tells the uproarious story of Monty Navarro, a distant heir to a family fortune who sets out to jump the line of succession by eliminating the eight pesky relatives (all played by one actor) who stand in his way. All the while, Monty has to juggle his mistress (she’s after more than just love), his fiancée (she’s his cousin but who’s keeping track? ), and the constant threat of landing behind bars. Of course, it will all be worth it if he can slay his way to his inheritance… and be done in time for tea. Waitress (April 11–22, 2018) With music by Grammy nominee Sara Bareilles, this stage musical is inspired by Adrienne Shelly’s beloved film. It tells the story of Jenna, a waitress and expert pie maker. Jenna dreams of finding a way out of her small town and loveless marriage. A baking contest in a nearby county and the town’s new doctor may offer her a chance at a fresh start, while her fellow waitresses offer their own recipes for happiness. But Jenna must summon the strength and courage to rebuild her own life. To read our review of the New York edition, click here. Jersey Boys (May 8–20, 2018) If you have to ask…..
Riverdance (Jan. 5–7, 2018) The 20th Anniversary World Tour. Wicked (Feb. 14 – March 4, 2018) Not sure what this one is about, but the plot sounds familiar. Season tickets for the six-show package range from $209 – $791. Patrons wanting to renew or purchase new season tickets can visit BroadwayInFortLauderdale.com. Subscribers may also call the Season Ticket Hotline at (800) 764-0700 Monday through Friday, 9 a.m. to 5 p.m. The Book Of Mormon (Nov. 21-26) See above. Finding Neverland (January 2-7) See above. Cabaret (Feb. 6-11, 2018) The ongoing tour of the revival of the revival reimagined for the Roundabout Theatre by Sam Mendes has been seen across South Florida now for years. But it will have a new fresh cast since the current one was ending its contract with its recent stand in Fort Lauderdale. To read our review of the tour from a year ago, click here. The Illusionists (March 6-11, 2018) This show featuring the impressive talents of five stage magicians was surprisingly effective when it played the Arsht Center recently. The producers have several different editions of this show available and the line-up of performers changes. To read our review of the Arsht edition, click here. The Bodyguard (April 10-15, 2018) See above. Something Rotten! (May 1-6, 2018) This hilarious musical comedy about the dawn of musical comedies is right up there with The Book of Mormon, Spamalot and The Producers for spoofy satires. Set in the 1590s, brothers Nick and Nigel Bottom are desperate to write a hit play but are stuck in the shadow of that Renaissance rock star known as “The Bard”. When a local soothsayer foretells that the future of theatre involves singing, dancing and acting at the same time, Nick and Nigel set out to write the world’s very first musical! Exclamation point intended. To read our review of the Broadway production, click here. And the following season, 2018-2019, Kravis On Broadway will host Disney’s The Lion King for the first time, although the date has not been specified. Subscribers for the Kravis On Broadway series will receive their renewals applications in early March. Kravis Center donors will receive information on becoming a subscriber for the 2017-2018 series in mid-May, and subscriptions will go on sale to the general public in June. For more information about becoming a donor, log on to kravis.org/membership, or call (561) 651-4320. For information about purchasing a subscription to Kravis On Broadway, contact the Kravis Center box office at (561) 832-7469 or (800) 572-8471, or log on to kravis.org/broadway. This entry was posted in News and tagged Adrienne Arsht Center, Broadway Across America, Broward Center for the Performing Arts, Emilio Estefan, Gloria Estefan, Hamilton, On Your Feet!, Raymond F. Kravis Center for the Performing Arts. Bookmark the permalink. This true story of a love and musical collaboration is the foundation of On Your Feet!